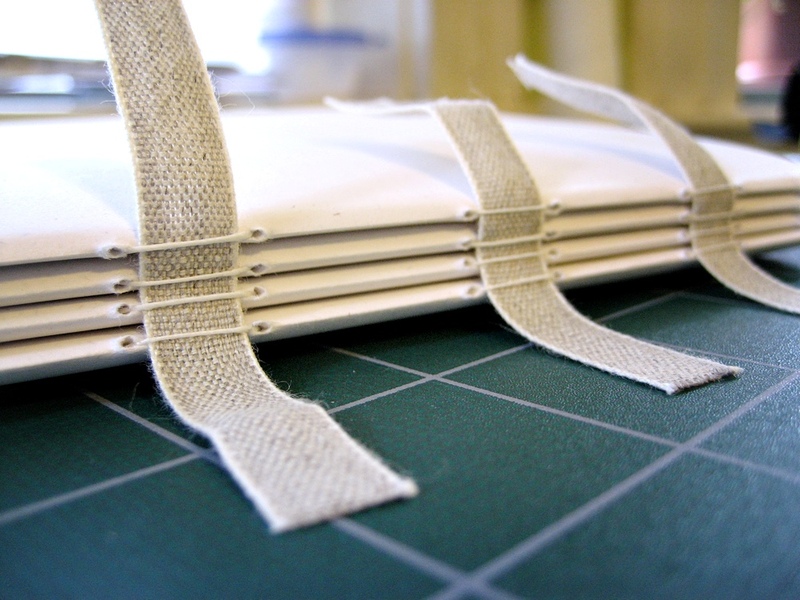 After the success of my pamphlet and single-section cased-in bindings, I couldn’t wait to bind another book. This time, I went for something more advanced: a multi-section cased-in binding. 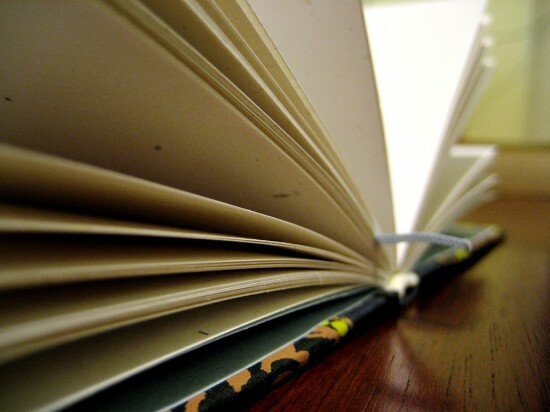 The single-section notebook is cute, but considering the work and materials that go into making the case for such a small text block, it’s not necessarily the most economical or practical of books. There’s a lot more work involved in creating a multi-section text block, but there’s not much of a difference in the case—just the addition of a spine stiffener. Given how well my first few experiments turned out, I decided that I was ready for the challenge. The text block has been sewn on three tapes. 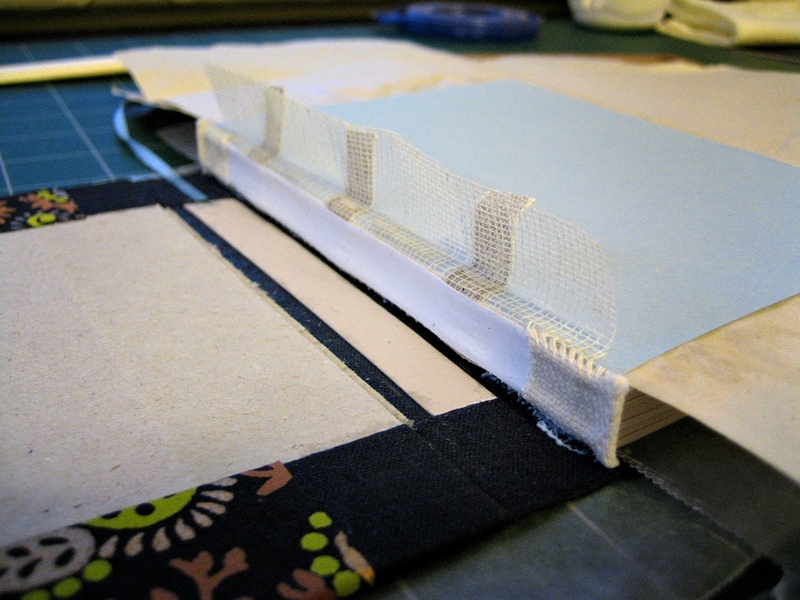 It’s a bit excessive for this size book; the text blocks I’m working on now will be sewn on two. Once the text block was sewn and the endsheets were tipped on, it was time for gluing. The spine got two layers of PVA, mull, a spine liner, and decorative headbands (next time: headbands beneath the spine liner). While the text block was drying, I worked on the case—although in the future (currently, in fact), I’ll be batch-processing the various steps as much as possible. Rather than give this book a full-cloth cover, I went with a cloth spine and decorative (screenprinted) paper on the boards. The rear endsheet has been glued down onto the case. It didn’t turn out perfectly, but for the most part the mistakes aren’t visible unless you’re really looking for them. The biggest problem is that the text block isn’t quite centered vertically. I think next time I might try a PVA/methyl cellulose adhesive mix to allow a little more time for adjustments; if I’m preparing text blocks and cases in batches, the increased drying time will be less of an issue. The finished book. Like the last one, I added a ribbon bookmark. The endsheets are the same light-blue color. The obligatory artsy shot of the finished book. I’m really proud of this one—I’ll be making a lot more like it. It felt a real sense of accomplishment when I finished this one, and I have some others planned; I have twelve signatures (three eventual text blocks) cut, folded, and punched, awaiting sewing, one of which will be a notebook for my boyfriend in a full-cloth cover for durability, and the second of which will be another one with decorative paper that I hope to fill with my own ideas for creative bindings. (Next mission: Find some cheap old maps?) My goal is to eventually get to the point where I always have a few text blocks ready for cases. That might prove especially useful come the winter; I see some hand-bound books in my loved ones’ futures this holiday season. 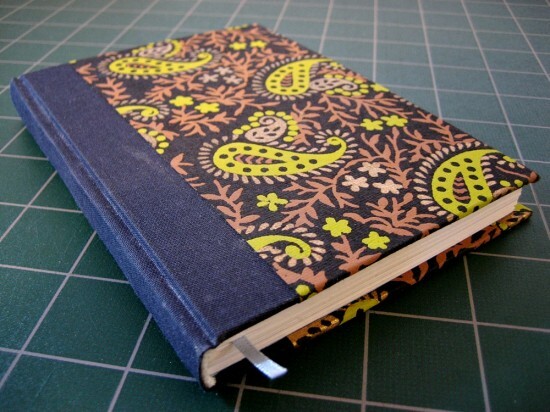 Good example of traditional hand binding. My first few books were so bad I destroyed them, but I found practice makes…er, nicer books each time. (They all have little imperfections, because they are hand bound by a real person, and that’s what makes them special). Keep binding! Maybe consider making the punched holes for sewing a little smaller next time as glue may seep into the middle of the section when applied.